With the years advancing, many country music fans have grasped the opportunity to catch the legendary performer Kris Kristofferson on this rare visit to the UK. Although he is now in his 77th year, the evidence of this sold out show at the elegant Birmingham Town Hall suggests there is still plenty left in the tank. Accompanied only by a single guitar, and being briefly joined on stage by his banjo playing daughter Kelly, the singer-songwriter/actor/legend gave a relentless performance of virtually non-stop hits that captivated an audience determined to savour every moment. The voice may be a little worn but then again that was never one of Kristofferson’s major attributes and probably why so many of his songs were taken to greater heights by others. The guitar playing was a little inconsequential and a mere side dish to the performance but then again much of country music is constructed around the infamous ‘three chords’. 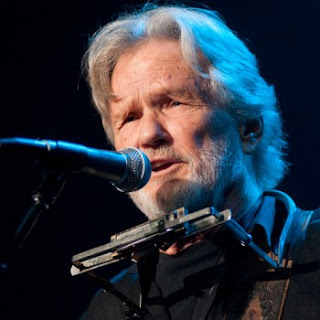 However it is that third element of a singer-songwriter -the song - that has elevated Kristofferson into the stratosphere of not just country music but to the industry in general. The chiselled Texas-born performer, who made his name in Tennessee before being embraced by the movie moguls of California, cuts an impressive figure on stage and despite being afflicted by the perennial cold that always seems prevalent in travelling US artists, delivered a brace of 45 minute sets that satisfied the cravings of his loyal fan base. For an artist with a lifetime of industry tales to tell, there was surprisingly little banter from Kristofferson. Only a couple of the many songs sung were introduced but the repeated outbreaks of applause during the first few lines for most of them suggested the audience needed little introduction. Highlights of the first set included performances of two of his most famous songs which had considerable crossover success – ‘Me and Bobby Gee’ and ‘Help Me Make it Through the Night’. Also from his vast back catalogue came ‘Here Comes That Rainbow Again’ and ‘Casey’s Last Ride’. ‘Nobody Wins’ saw a brief comment applauding Obama’s recent election victory while two other notable inclusions in the opening part were ‘El Coyote (the Lonesome Coyote survives)’ and ‘Johnny Lobo’. It was very much the same after the break except for the short period when he was joined on stage by his young daughter, Kelly. They sang a handful of duet numbers with the most memorable being ‘The Pilgrim Chapter 33’. Kelly’s banjo playing enhanced the tunes performed and while the harmonies were not exactly top drawer, you could forgive this brief moment of family indulgence. Either side of Kelly’s appearance, the hits continued to roll including ‘Jody and the Kid’, ‘Silver Tongued Devil and I’ and ‘Billy Dee’. Increased crowd appreciation was in evidence for another of his most popular songs ‘For the Good Times’ and the one which eventually brought the evening to a close ‘Why Me’. However for me, seeing Kristofferson live for the first time, the evening was all about one song. I had always considered the Johnny Cash version of ‘Sunday Morning Coming Down’ to be the best but the pleasure of listening to Kris Kristofferson deliver his most famous composition live was a pure humbling experience. It ranks easily amongst the very best live songs enjoyed in person and rounded off an evening that in reality may not be witnessed again.